I made a nice big batch of this delicious, juicy, flavorful chicken breast to use all week on top of salads, in tacos and wraps, and in burrito bowls. 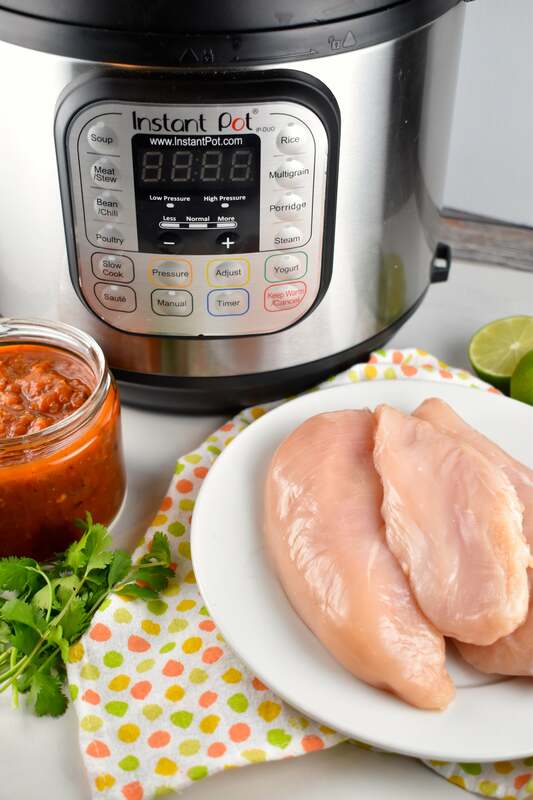 Basically, it’s just 2 simple ingredients in your Crock Pot or Instant Pot – a jar of your favorite salsa and chicken breasts. 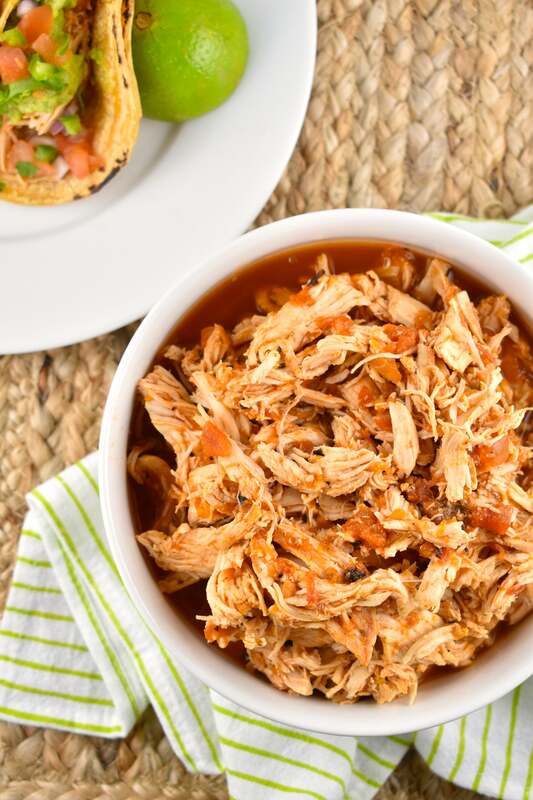 It literally takes just a few minutes to throw these two ingredients together, and then your slow cooker (or Instant Pot), will do it’s magic, and you’ll be left with some perfectly seasoned slow cooker shredded chicken to use on countless dishes. If you love Mexican flavors, you are going to want to give this easy chicken recipe a try because you will be thrilled with all of the amazing ways you’ll be able to use it! It’s ideal for meal prep and packed lunches, and is always a huge help to me if I have NOTHING prepared for myself for lunch and need to throw together a quick, healthy meal. I like to keep a container in the fridge for quick and easy access, and then use some to prep a few meals for the week. I cannot even begin to tell you how much I rely on this recipe. Seriously, it is SO easy. And if you haven’t ever done it before, you are going to be super excited when you realize what a game changer this is! 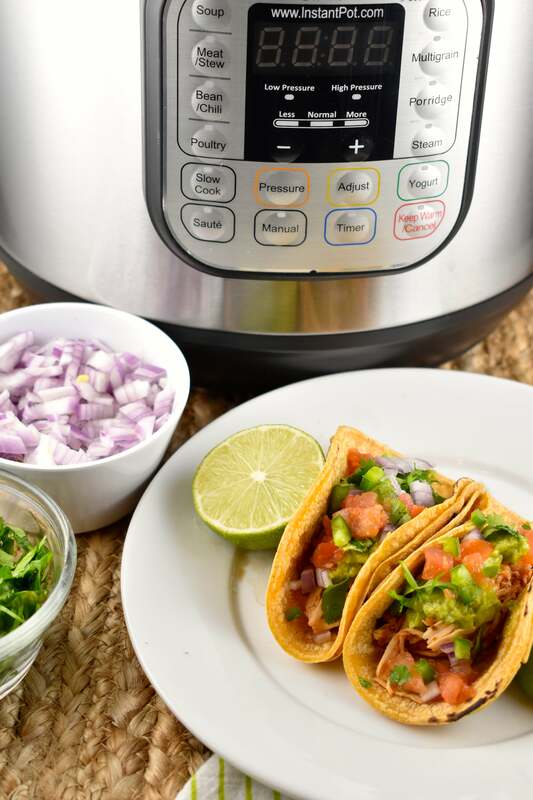 I have cooked it in both my Instant Pot pressure cooker as well as with the slow cooker option, and both methods work out perfectly, with no differences. 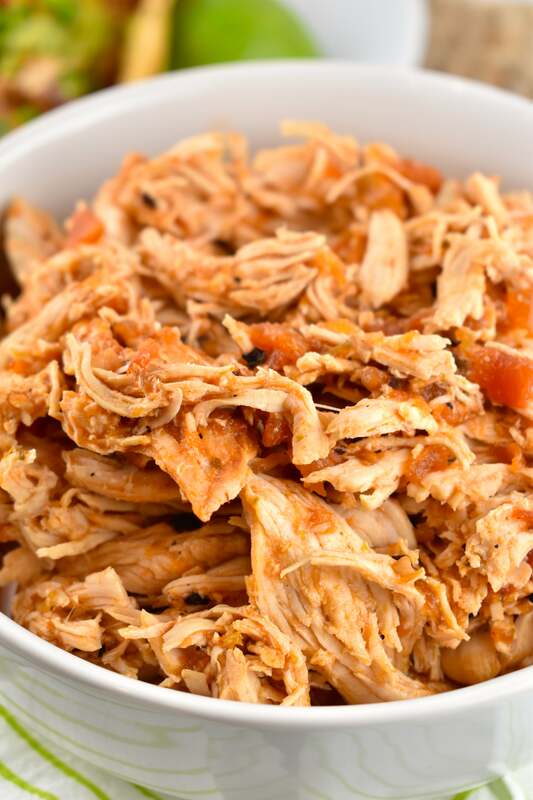 I use the slow cooker method if I’m busy and want to set it and forget it for a few hours, and I use the Instant Pot method if I’m going to be cooking in the kitchen for a while and/or need to use that tasty chicken sooner rather than later. 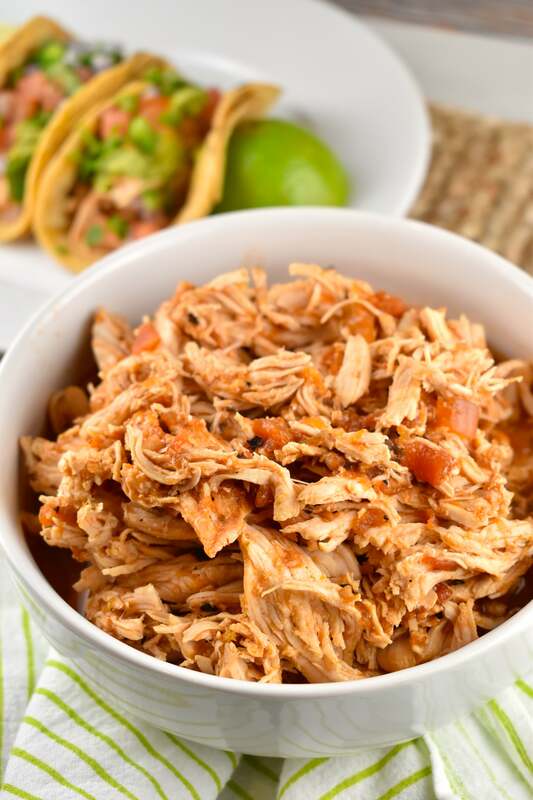 This salsa chicken will work well in just about any Mexican dish you can think up – burrito bowls, tacos, salads, taquitos, flautas, enchiladas, nachos, you name it! But the key to the success of the recipe is using a really good salsa. Because the chicken will release a lot of liquid when it’s cooking, you’re going to want to use a really bold flavored salsa with this, as the flavor of the salsa will get watered down a bit. I have tried it with quite a few, and my personal favorite is Trader Joe’s Garlic Chipotle Salsa. The bold, smoky chipotle flavor makes this option work SO well! But if you have no TJ’s near you, fear not! Just pick your own favorite salsa. You can always season it up with some extra salt and pepper. 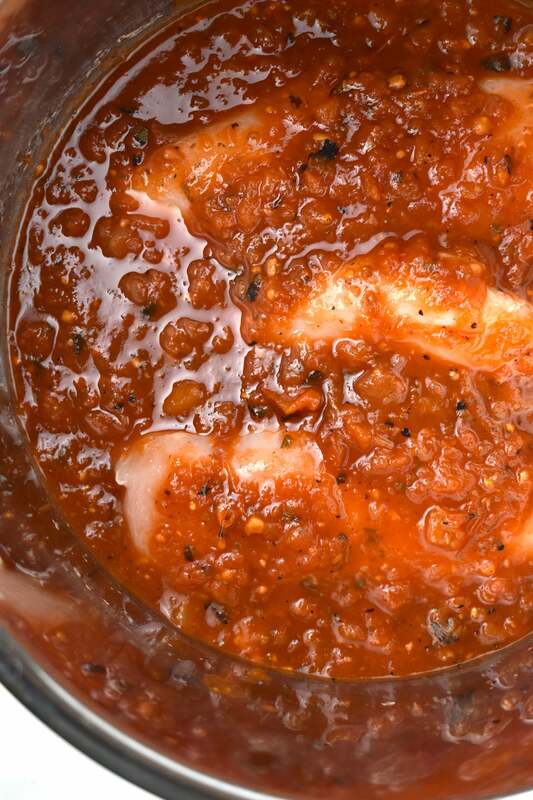 If you are in a pinch, you can even make your own with my 5 Minute Restaurant Salsa Recipe! It works great with that salsa too. 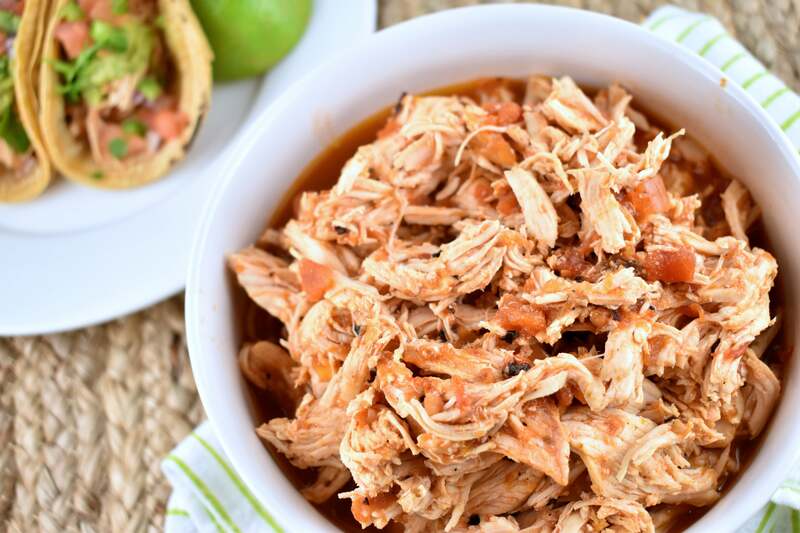 Mexican slow cooker shredded chicken could not be any easier with this Crock Pot Chicken Salsa Recipe. You seriously must give this one a try! TRY IT IN THESE MEXICAN RECIPES! Fresh chicken breasts are combined with salsa to make tender, juicy, perfectly cooked, chicken meat, with incredible Mexican flavors. Great for using in tacos, burritos, on top of salads or baked potatoes - endless possibilities! Place chicken in your crock pot. Pour salsa over top. Cover with lid and cook on low heat for 6 hours or high heat for 4 hours. Using two forks, shred the cooked chicken. Place chicken in the pressure cooker. Pour salsa over top. Cover with lid and set it on POULTRY for 15 minutes. Allow to natural release for 15 minutes. My Instant Pot does not have a poultry setting. What is the equivalent – high pressure? If I make this in the instant pot, can I add corn and black beans? I know it may change the points but how will it affect the cooking time? Hi Debbie! Great question! Yes, you can add corn and canned black beans (not dried beans). This would not affect the cooking time, and it doesn’t affect the Points as corn and black beans are both 0 Point foods.